V W Bro Bob Cameron, and W Bro Gordon Johnston, Lodge Almoner. 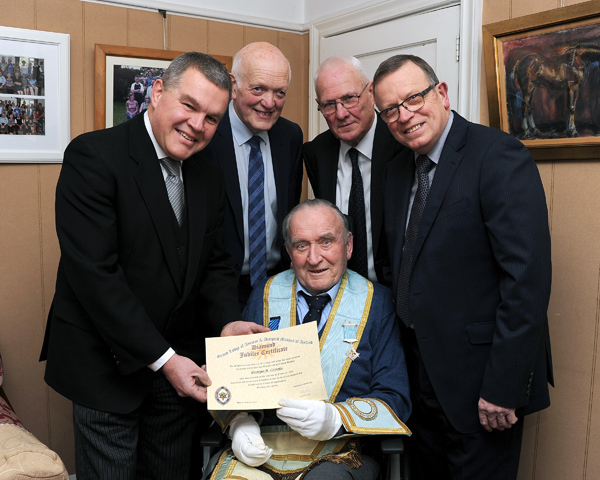 Very Worshipful Brother George Crooks received his Entered Apprentice Degree on 2nd February 1959, was passed to the Degree of Fellow Craft on 2nd March1959 and was raised to the Sublime Degree of Master Mason on 4th May 1959. He was Worshipful Master of the Lodge in 1977, and went on to hold the offices of Lodge Secretary from 1980 - 1990, and Chaplain from 1990 - 2010. He topped off an illustrious career in Masonry by holding the offices of Inner Guard, Sword Bearer and Inspector in the Provincial Grand Lodge of Tyrone and Fermanagh, and then held the offices of Inner Guard, Sword Bearer and Junior Deacon in Grand Lodge.